Graded GOOD 2 by PSA (submitted by REA). Exceptionally attractive example of Cleveland Naps Hall of Famer Nap Lajoie from the E98 “Set of 30” candy-card issue. The manufacturer of E98 is unknown, and the set may be easily confused with other caramel-card sets of the era (E93 and E94 specifically); this is an entirely different set even though it uses many of the same subjects and poses. 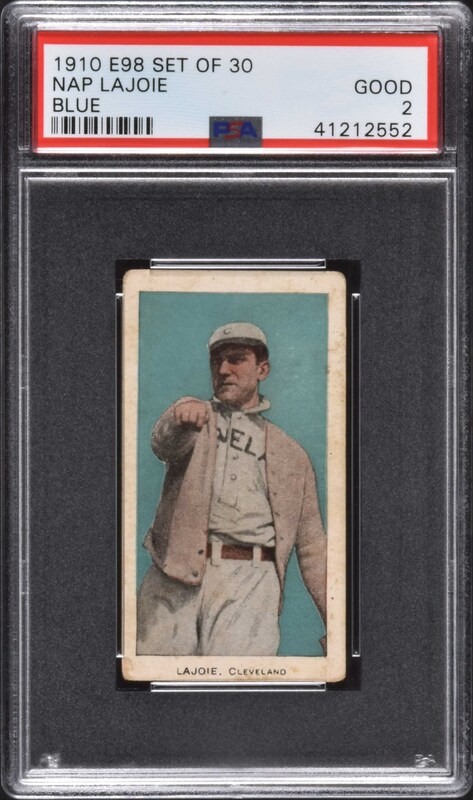 For many years, E98s were among the scarcest of the 1910-era caramel cards, but the recent “Black Swamp Find” has changed the population dramatically. E98s have always been very desirable, and their increased availability and noteworthiness due to the find may have actually increased the demand as more collectors have become familiar with the set. The offered card is bright and crisp, with a bold blue background. Centered a bit toward the left, with a slight tilt to the picture. Honest corner wear, light caramel stains, and a crease near his left shoulder account for the assigned grade. The reverse has a checklist for the set. 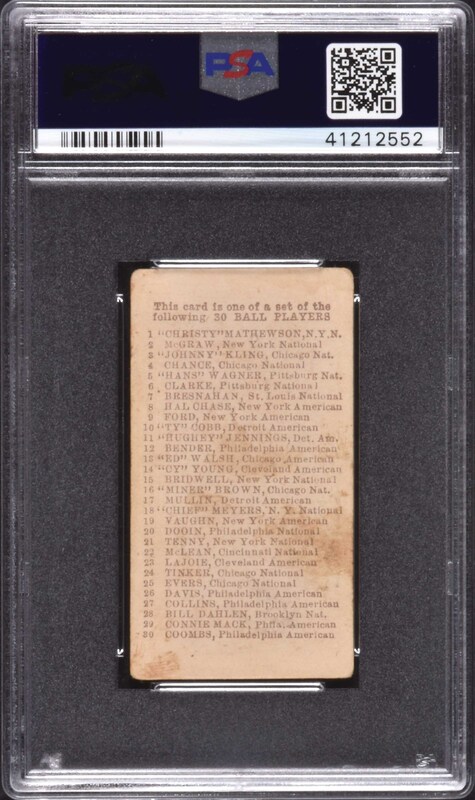 Caramel cards in general are much rarer than tobacco cards of the era. Because they were issued with caramels one card per package and sold to children (as opposed to being sold to adults with tobacco), they also tend to survive in a much lower grade. This is a very attractive example of Hall of Famer Nap Lajoie from this extremely desirable early twentieth-century candy issue. Reserve $200. Estimate (open).